“I’ve made a Walt Disney movie. A cross between Willy Wonka And The Chocolate Factory and The Computer Wore Tennis Shoes. It’s gonna do eight, maybe 10 million.” George Lucas was wrong about a lot things. That Star Wars might work if Luke Skywalker and his aunt and uncle were dwarves. Or that the entire cast should be oriental. But from that over-the-shoulder opening shot of an Imperial Starship blotting out the twinkling vastness of space, its deafening engines filling the air, Lucas had got everything else right. Proudly hanging its white hats and black hats on old-fashioned ideas of heroism and happy endings – and this in a dark, war-torn, drug-addled, bloody decade – Star Wars captured the heart and dazzled the senses. Sinking his budget ($11m!) into ILM’s revolutionary CGI visual-effects and Dolby Stereo surround sound instead of star salaries, Lucas became one of the few directors in history to give audiences something they’d never seen before. Although they had, of course. The farmboy turned Knight, the imprisoned Princess, the wise master, the evil Lord and his Empire… Built on everything from Kurosawa (The Hidden Fortress , Yojimbo ) and John Ford (The Searchers ) to ’30s pulp sci-fi serials (Flash Gordon , Buck Rogers ) and James Bond, Star Wars’ space opera could have taken place in Camelot, the Wild West, WWII, ancient Greece or the high seas. Not a frame isn’t borrowed from somewhere else. But by recycling and resending these references back into the cultural consciousness in such unforgettable style, Lucas created an immortal popcorn movie of thunderous mythic power. 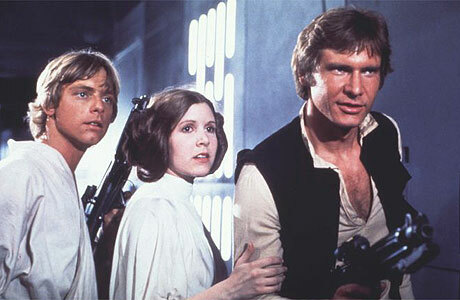 For better or worse, Star Wars changed cinema and cinema audiences like no other single film. And Episode IV – A New Hope would become a bitterly ironic title for many. “It ate the heart and soul of Hollywood,” said Paul Schrader. But measured simply by popularity and profit, Hollywood’s favourite markers, it is the greatest film ever made.